This week I’ve been relaxing listening to some fingerstyle and slide guitar blues played on resonator guitars. I totally love that sound and they’re beautiful instruments to look at too. So I thought I’d paint one. It was quite fun because the resonator is beautifully shiny giving me a bit of a challenge painting-wise. Now I just can’t paint one of these beauties without hearing a few of them ‘sing’. I definitely prefer the wooden body resonator guitars. I think the tone is just so much warmer. This is ‘The Swamp Dog Blues’ played on a 1930’s Broman Resonator Guitar. Unfotunately I don’t know who the musician is on this lovely piece. He makes the guitar cry. I think it’s beautiful. I also totally love this sound (below). This is Mike Dowling playing “Blues in G“. I love the subtlety and understated character of this one. This week I worked on a small project in my sketchbook again. It’s the last week of term so I’m pretty tired and still struggling with my health. While I was working on this painting I had a big period of time when it looked bad. I think this is quite common in art. I had to rework the background from scratch in fact. I painted my main subject with gouache and then tried to put a watery watercolour background in but it didn’t work so I went for a background which reflected the style of the flamingo in the end. I am really grateful this year for the coming holidays, since my body’s a bit stressed out and unwell at the moment, but generally speaking I don’t like the summer holidays at all. I find change difficult. I will be teaching different children next year and I will miss those I worked with this year. I also find the change from working to holidaying quite stressful too. I think it’s probably just the autism, my neurology seems to be very sensitive to change. I feel like a boat afloat without an anchor or an engine when change comes. I don’t know what I’ll be facing, I can’t prepare for it and so I have to fight down panic when I think about it. Comics, like Judge Dredd and Star Wars, Science Fiction and Fantasy like Harry Potter and Asimov’s Foundation series, and going fishing, these things all help. 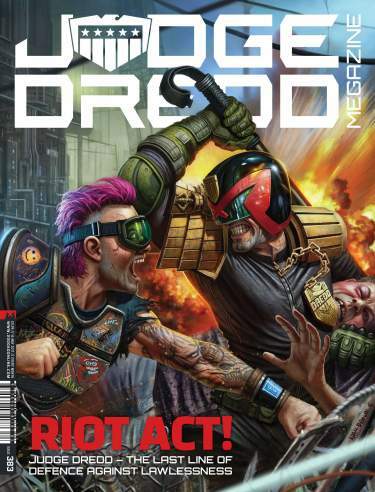 Here’s an amazing Judge Dredd Megazine Cover by Adam Brown – all rights belong to Rebellion. They are what is know in ASD terms as ‘special interests’. Research has shown how an autistic’s interests help support them in times of stress and that’s certainly true for me. They are like a safe place to go when the world is too much to cope with. Also, for me, my faith also helps a lot, since for me, God is always there, always loving and always the same. I drew a small quick picture of a jellyfish this week in my sketchbook. I made a bit of a big mistake in that I didn’t use any reference. I should have done but my pain was bad, so I drew the sketch in bed and didn’t get around to looking up reference. I think it really shows too. Ho hum – you live and learn. Originally I used a deep yellow and purple colour mix but I think it looked better when I added reds and blues to it which is what you see here. This week I completed the bigger project I’ve been working on for a few weeks – ‘Love’s Sacrifice’. This painting meant quite a lot to me. I think that might be why it took me so long to complete. I know that most people nowadays don’t follow the same faith as me and that makes it difficult to talk about these things because, although it is the truth most central to my life, I have no wish to push it onto folk who don’t want it. I feel quite strongly that faith is only real when it is freely chosen and not forced. For me the Christian faith is simply about walking in the way of love everyday as far as I am able. My experience of love is that when you really love another person you put them before yourself, you want what is best for them and you are willing to give of yourself for their well-being. That’s what this picture means to me. It’s about the cost of love and the power of love, when given, to make others whole. Apologies to those who are not religious or who follow another religion, I’m not so good at talking about these things. I hope I haven’t offended anyone. My inspiration came from sunny Utah this week. I watched ‘127 Hours’ again. It’s a film about a guy called Aron Ralston who went canyoneering without telling anyone where he was going or when he would be back. He was really experienced in the outdoors but got caught out when a large boulder shifted and trapped his arm leaving him completely stuck. After watching the film I was struck by the beauty of the canyonlands. The nearest we have to this kind of thing is the Cheddar Gorge in England and because of the rain the land is very green and lush, quite unlike Utah’s harsh orange beauty. So I looked through a lot of photos of the canyons and the mesas and decided to make a picture of them. I used a similar style to last time (England in the Summer) where I avoided blending and just used shapes to convey the surface of the landscape. I like the clarity and solidity of each field of colour and because I really like that, it really helps me avoid painting every detail and instead look for the general shapes which is something I find really hard.